The Firefighter's Tribute is dedicated to the courage and dedication of the Stanley fire fighters and emergency services worker and a place for the community to reflect on the experiences of Black Saturday 2009. The design of this unique contemplative space relates to the four elements of fire, water, earth and air. Central to the design is a fire pit for communal gatherings, to remind the community that fire is also a means of comfort, warmth, and fellowship. The site also includes a striking sculpture crafted from steel and local quartz rock. 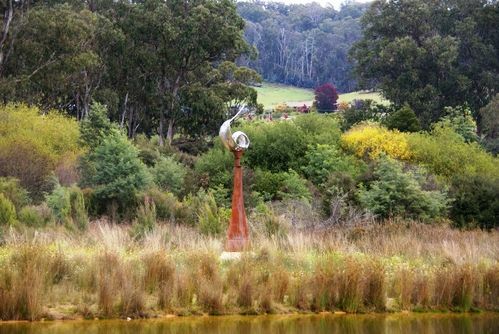 The sculpture was funded by the Federal and Victorian Governments as part of a project to honour those who died in the Black Saturday fires and pay tribute to the people involved in the recovery effort. On February 7, 2009, a day that was dubbed “Black Saturday” in Australia, deadly bushfires swept through the southern state of Victoria, leaving 173 people dead and 500 injured. In addition, more than 2,000 homes were destroyed, and experts estimated that the number of affected wildlife (killed or injured) was well into the millions. In Beechworth, a fire burnt over 30,000 hectares (74,000 acres) and threatened the towns of Yackadandah, Stanley, Bruarong, Dederang, Kancoona, Kancoona South, Coralbank, Glen Creek, and Running Creek.